For the uninitiated, the Red Sea is a seawater inlet of the Indian Ocean lying between Africa and Asia. Thanks to the announcements of the Federal Reserve in the US late last night, and Ben Bernanke’s very clear commentary of how he expects the Federal Reserve to run its monetary policy over the next 18 months or so, the Red Sea shifted to financial markets today. 1. A tapering off of fresh buying of securities from the current level of USD 85 billion per month that they are at currently starting from later this year. Most analysts seem to expect that to be around September 2013. 2. A gradual end to all buying of securities which could happen by mid 2014. Of course, this is provided that unemployment in the US gets lower and inflation starts to rise. There is now an expectation that interest rates in the US start to move up from end 2014, early 2015. Whilst none of this was unexpected, the clarity seemed to have upset market participants, who wanted to run to the safety of the US dollar and US treasuries. Whilst this reaction could well continue for a while longer as different constituents look at these events through their own prisms and risk comes off, and also move further to US treasuries where yields become more attractive, past experience indicates that events of these kind, though negative in the short term, create opportunities for investors to rebalance their portfolios, both amongst asset classes and within asset classes. Over the last thirty years, yields on US treasuries have moved up substantially multiple times. In over two thirds of these instances, this has resulted in gains for equities as well, especially in Asia. Such events provide entry opportunities to add exposure to equities. It would be interesting to look at this from a historical perspective. Over the last thirty years, yields on US treasuries have moved up substantially multiple times. In over two thirds of these instances, this has resulted in gains for equities as well, especially in Asia. Thus, investors need to look at opportunities provided by events of this kind to add exposure to emerging market equities, especially as valuations are reasonable. For example, Indian markets currently quote at a trailing price to book of 2.7 against a historical average of 3.6. Ditto with forward price earning ratios, which are currently at about 14 times, against a historical average of 16 times. With most investors already underweight on Indian equities in their portfolios, we think this is a good time to start buying. In addition, cooling oil and gold prices could be great for the Current Account Deficit that has everyone in India so worried today, providing a further kicker to equities. Other parts of Asia also seem to have similar valuation opportunities, with a very large part of Asia quoting at a significant discount to long term averages on both PE and PB parameters. Whilst buying equities is always fraught with downside risks over short periods of time, buying at reasonable valuations has always played out well over the long term. Building a diversified portfolio across emerging market equities is recommended, even though it may be tempting due to a home bias, to run a 100% domestic equities portfolio for Indian investors. Investors can also look at equities in markets like the US where a recovery could kick start a virtuous cycle, driven by corporate sitting on cash rich balance sheets, at higher levels than ever before. On the fixed income side, with the Indian rupee under pressure due to the strength of the US dollar, and inflation likely to reemerge, interest rate cuts could get slower and less predictable, making it important that investors use a combination of both duration strategies like income and dynamic funds, as well as accrual strategies like short term bond funds, and deposits in their portfolio. In case they were overweight duration strategies, they need to rebalance. Gold hit a two and a half year low, and whilst it could be tempting for investors to add further to their portfolio, the significant exposure that most Indian portfolios already have to gold through a combination of jewelry and investments, would make it difficult to recommend further exposure. Whilst it is very tempting to stay out of financial markets at this stage and come back later, market timing simply does not seem to work. So stay invested and keep investing. Of course this assumes you’re in it for the long term. Ultimately, if you go to North India in summer, you know its going to be very hot. You don’t panic because the temperature has gone above 45 degrees Celsius. Independence and freedom are amongst the most inspirational words in the English dictionary in my opinion. They evoke a sense of hope, inspiration, choice and joy all at the same time, and could mean very different things to different people. For example, a very large number of investors whom I work with, when asked about their financial goals, indicate that they would like to achieve financial freedom. When I ask them what financial freedom means to them, their answer is: When I do not have to work for the money and can actively decide how, when, and with whom I choose to associate in my professional life. Financial freedom can mean different things to different people. Financial planning allows them to be financially free i.e. decide how they wish to lead their lives. Over my years of running a practice, here are two examples of people I work with, who we believe financial planning has helped achieve the freedom to do what matters most to them. Dr. Kumar (name changed) is a cardiologist and runs a hospital in suburban Mumbai. Irregular and long work hours mean that there is very little time to spend with his two young kids and his wife. What he really looks forward to, is spending time with his family and enjoying the kids’ growing up and continuing to stay connected with his wife. Booking and planning his holidays each year – one long international holiday, another week to ten day long domestic holiday and some weekend breaks are what he absolutely loves. The finances for these holidays are a part of his financial plan. 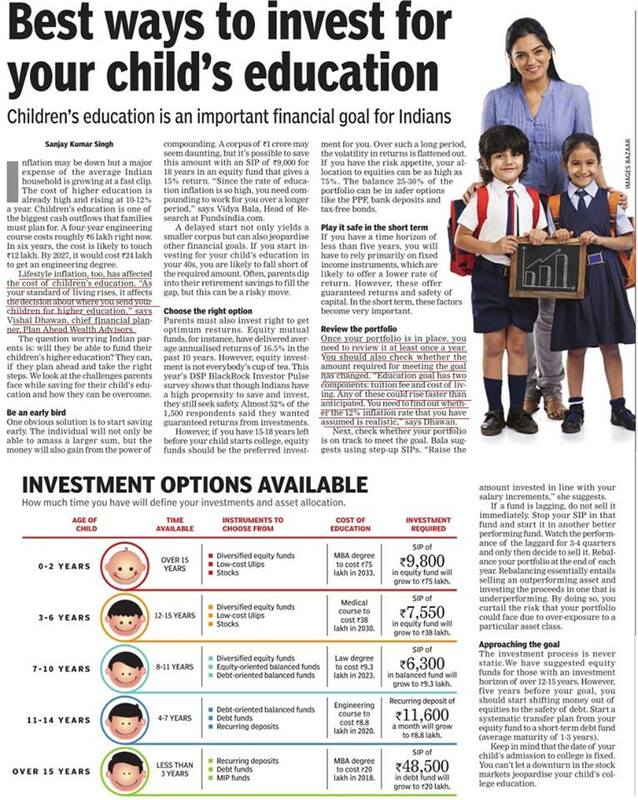 Whilst there are clearly earmarked long term investment strategies for his longer term goals like retirement and education for the children, there are also separately defined strategies for shorter term holiday goals through the use of financial instruments that can give him the most optimal returns for these goals, on a post tax basis. 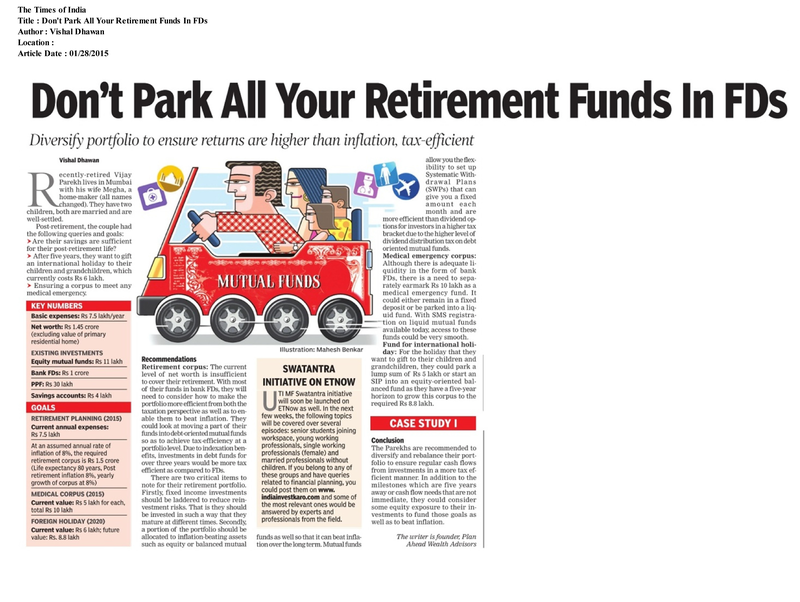 Debt mutual funds of varying maturities can be used very efficiently for shorter term returns. Sanjay and Rashmi (names changed) are currently 39 and 37 respectively and they have a daughter who is 6 years old. Sanjay runs a small sized family business and Rashmi works with a chartered accountancy firm. When most couples are just about beginning to save for their financial goals, and are looking to save for their retirement and childrens future, both Sanjay and Rashmi have already achieved their financial goals ie even if they do not save any monies from here onwards, and let their existing portfolio grow, they will be achieve their financial goals. This has been possible through a combination of a conservative lifestyle with controlled expenses, a savings rate in excess of 40% of total income, controlled use of leverage on a home loan that has been prepaid aggressively, and a diversified portfolio across equities, fixed income, real estate and gold, that is rebalanced regulary. So what does financial freedom mean for you? Choose your financial freedom the way you want it.